I'm starting a new job tomorrow, which means getting up earlier than I'd like. Hey, congratulations! Good luck with the new job. And I rarely manage the dressed part until midday. Pyjamas are just so comfortable. Oh I love me some Bansky! Thanks! It's a cool freelance gig. Perfect to keep me occupied (and offset bridal spending) until we leave town. I'm good thanks, suddenly really aware that I'm getting married! It seems so soon. Delegating jobs to the boys is definitely the way to go. N has taken over food and music because I've had enough of both! Congrats on the new job! Hope it goes well. 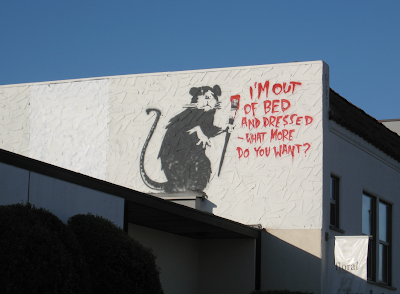 oh, how I love me some Banksy.